Yes, my search has ended! 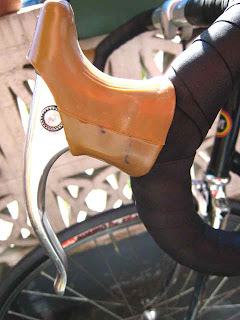 It all started innocently enough with my search for brake lever hoods. Portland bike stores was my objective and I was adamant of finding a pair. 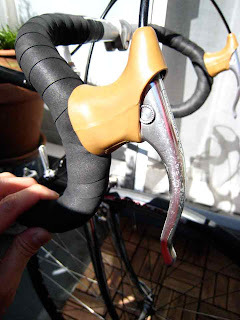 I'm very proud to show you my brake lever hoods. 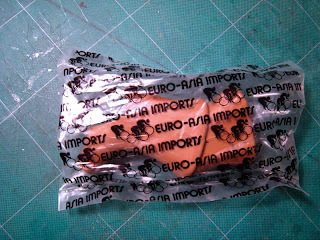 It took quite sometime looking for replacement hoods for my old Campy Nuovo Record ones. These knock offs are from a company called, EAI (Euro-Asia Imports). Although, they fit a wee bit tighter than the Campy's ...I'm estatic with the results! My thanks to Demetri from Veloce Bicycles for making my journey well worth it. And a special thanks to Verg of Revolver Bikes! 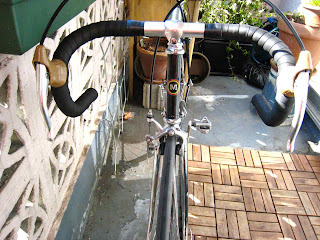 It's also good reason to put on new handlebar tape! 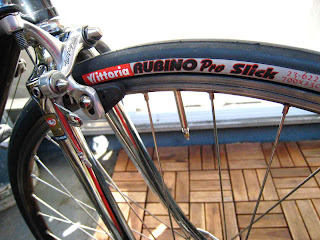 Love my new Vittoria Rubino Pro Slicks. I'm running them around 110 psi & they grip so well!